Zoe is originally from the East Coast and she has a big, wonderful East Coast family with whom she keeps in very close contact. Her family is complete with a charming brood of young nieces and nephews, and they enjoy knowing what Aunt Zoe is up to. One cute way Zoe came up with to communicate with all the kids is to take along a little Moo Cow doll belonging to one of the kids and take photos at different destinations here in So Cal. The kids love seeing their Moo Cow at all these interesting places. This Physics Groupie thought that tradition was a fantastic idea so I decided to extrapolate the concept a bit and I came up with a new theme that all you Science Lifestylers might use – introducing Moo Cow’s Science Adventures. 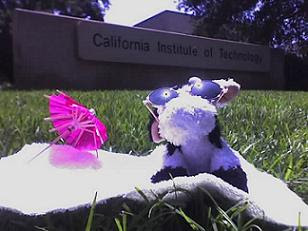 See the inset photo of friendly Moo Cow sunning herself over at Caltech. Moo Cow has also been to Mars, and I’m sure you can come up with all sorts of new science adventures for your own version of Moo Cow. So if you have any kids in your life that you want to impress with your science escapades, bring your own Moo Cow along for the ride!